Introduction: Several measurement methods designed to provide an understanding of cervical sagittal alignment have been reported, but few studies have compared the reliabilities of these measurement methods. The purpose of the present study was to investigate the intraexaminer and interexaminer reliabilities of several cervical sagittal alignment measurement methods and of the rotated cervical spine using plain lateral cervical spine X-rays of patients with cervical spine disorders. 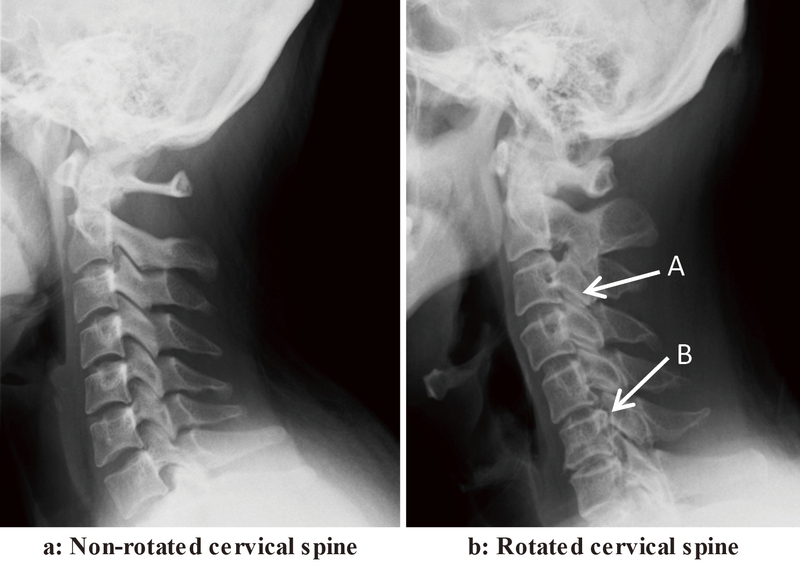 Methods: Five different measurement methods (Borden&apos;s method; Ishihara index method (Ishihara method); C2-7 Cobb method (C2-7 Cobb); posterior tangent method: absolute rotation angle C2-7 (ARA); and classification of cervical spine alignment (CCSA)) were applied by seven examiners to plain lateral cervical spine X-rays of 20 patients (10 randomly extracted cases from a rotated cervical spine group and 10 from a nonrotated group) with cervical spine disorders. Case 1 and Case 2 intraclass correlation coefficients (ICCs) were used to analyze intraexaminer and interexaminer reliabilities. The necessary number of measurements and the necessary number of examiners were also determined. The target coefficient of correlation was set at ≥0.81 (almost perfect ICC). Results: In both groups, an ICC (1, 1) ≥ 0.81 was obtained with Borden&apos;s method, the Ishihara method, C2-7 Cobb, and ARA by all examiners. The necessary number of measurements was 1. With CCSA, a kappa coefficient of at least 0.9 was obtained. In both groups, with Borden&apos;s method, the Ishihara method, C2-7 Cobb, and ARA, the ICC (2, 1) was ≥0.9, indicating that the necessary number of examiners was 1. The standard error of measurement (SEM) was lowest with Borden&apos;s method, and the Ishihara method and C2-7 Cobb had almost the same values. Conclusions: Among cervical sagittal alignment measurement methods for cervical spine disorders, regardless of cervical spine rotation, Borden&apos;s method, Ishihara method, and C2-7 Cobb offer stronger reliability in terms of the ICC and SEM.